Centrale Montemartini is an amazingly awesome, undervisited museum and a stunning example of 20th Century industrial archeology. 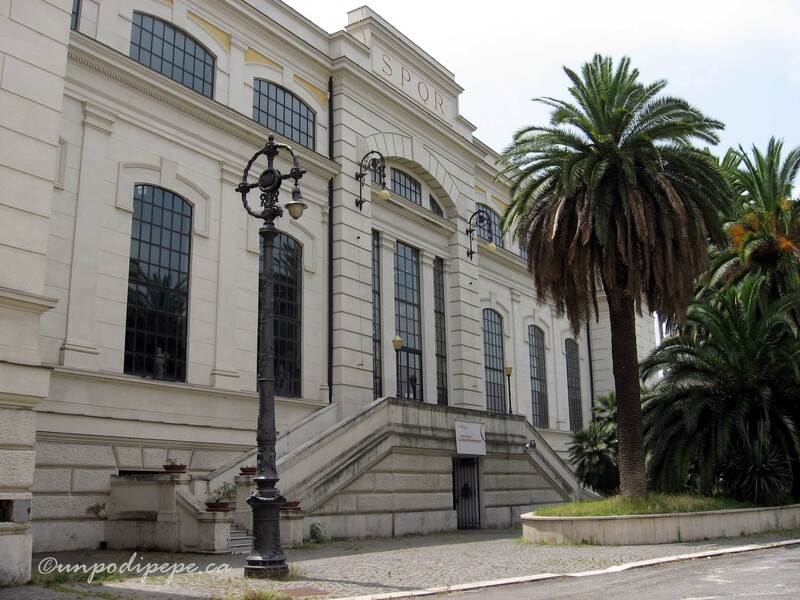 Built in 1912 in Art Nouveau style (Stile Liberty), it was the first public electric plant in Roma, providing power for the surrounding area until it was abandoned in 1963. 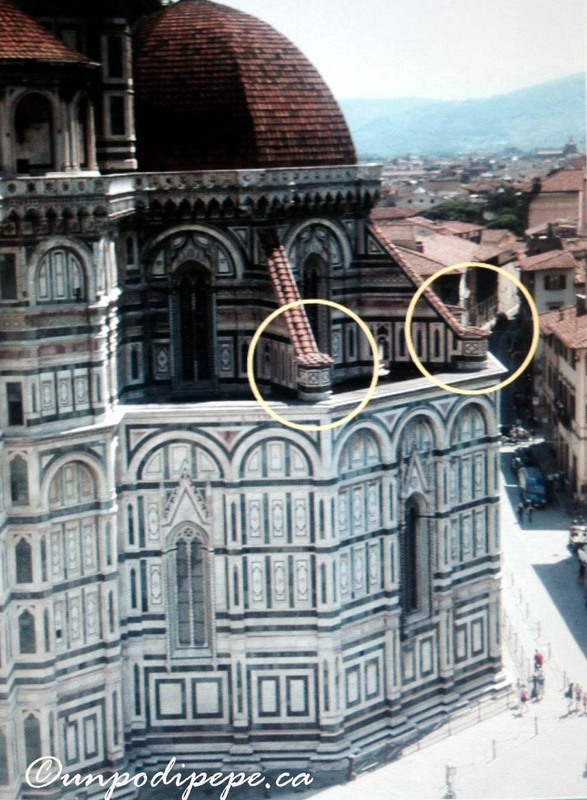 Luckily the amazing architecture and historical importance saved it from demolition! 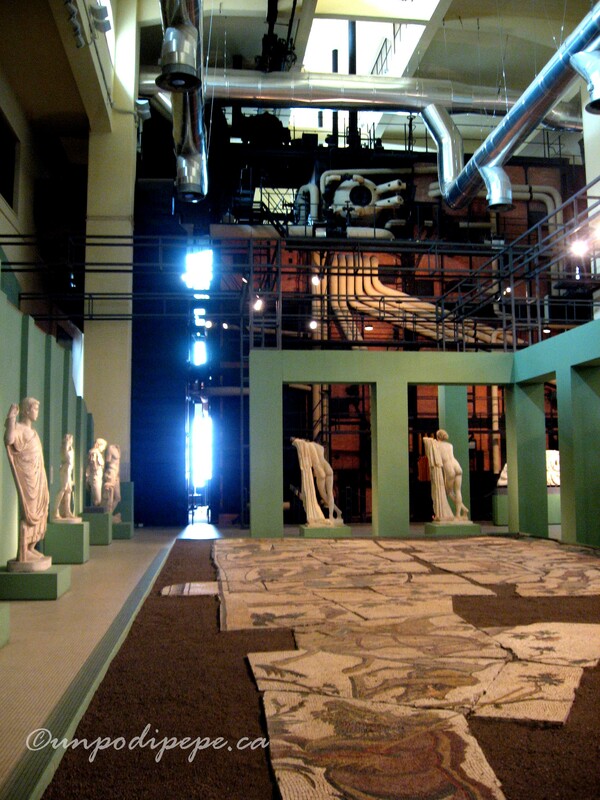 In 1997 during the Capitoline Museum renovation, Centrale Montemartini was used for a temporary exhibition ‘Le Macchine e gli Dei’ (The Machines and the Gods). In 2005 it became a permanent space for part of the Capitoline collection, with all of the original thermoelectric equipment left in place. 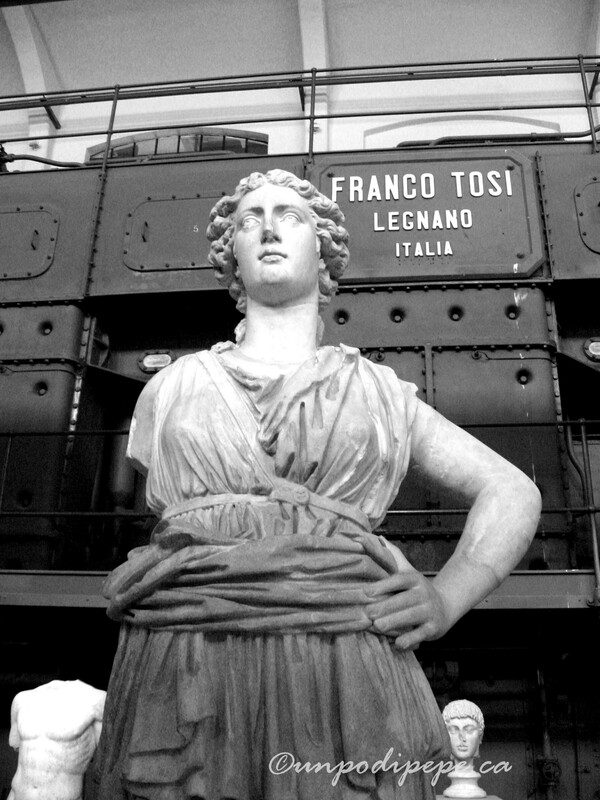 Now you can visit a unique display of classical sculpture against an industrial backdrop of steam boilers, diesel engines, catwalks twisting pipes and gauges. 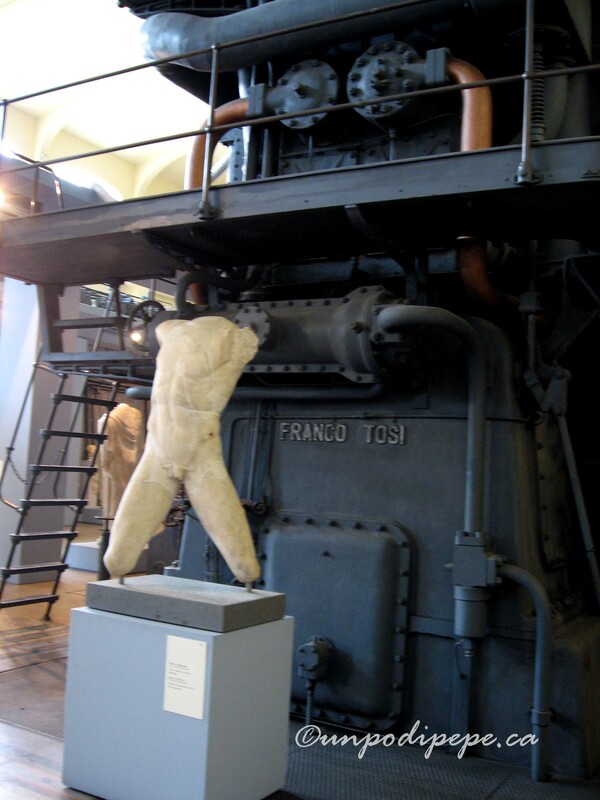 It’s a blend of ‘vecchio e più vecchio’ (old and older), a stark contrast of ancient and industrial, art and science. Antique white marble appears translucent against the blackness of the machinery. The space is immense and silent, with high ceilings and tall windows providing natural light. The works of art are carefully chosen and placed so there is space to appreciate their beauty while you walk among them and contemplate the passage of time. 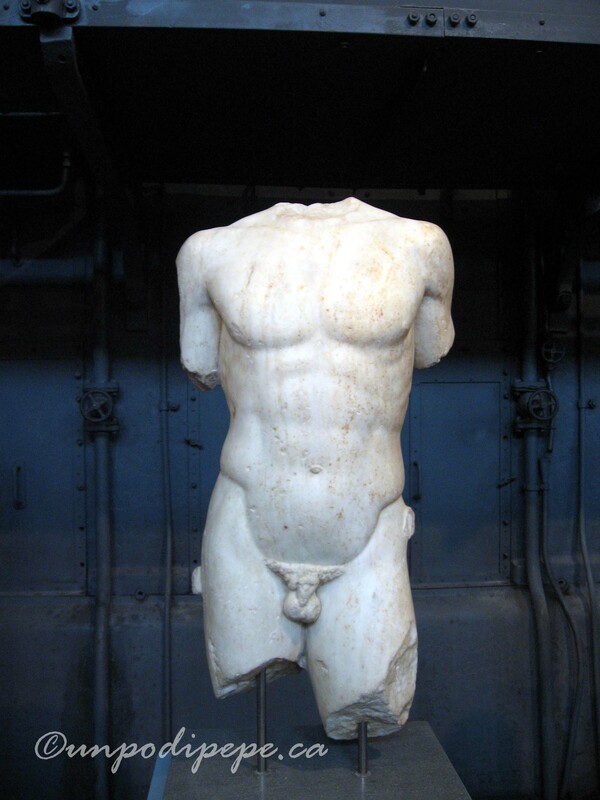 The 400 pieces include ancient Roman sculptures, rare Greek originals brought to Roma, and Roman copies of Greek originals. 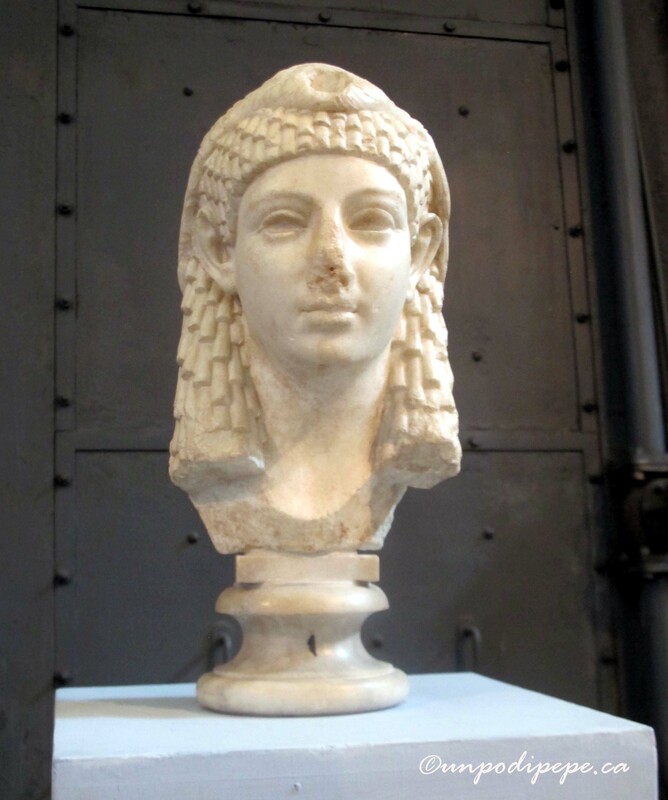 They date from the 5th Century BC to the 4th Century AD and were found in the late 19th and early 20th Century. Most of the works are on the upper floor in 2 massive rooms. 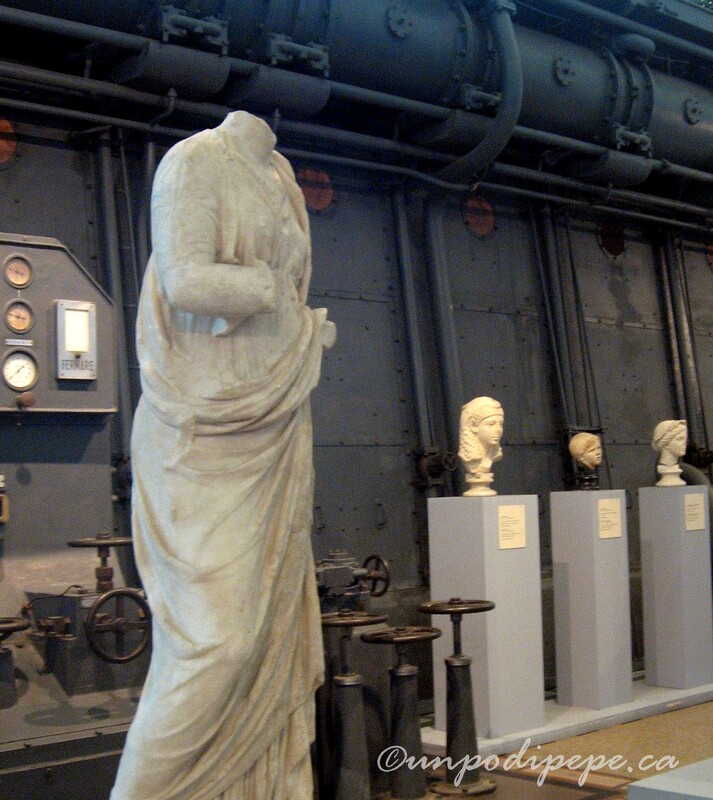 In Sala Macchine (Machine Room or Hall of the Machines) 2 hulking diesel engines are surrounded by Roman replicas of Greek statues. At one end, a reconstruction of the pediment of the Temple of Apollo Sosiano depicts a battle between Greeks and Amazons. 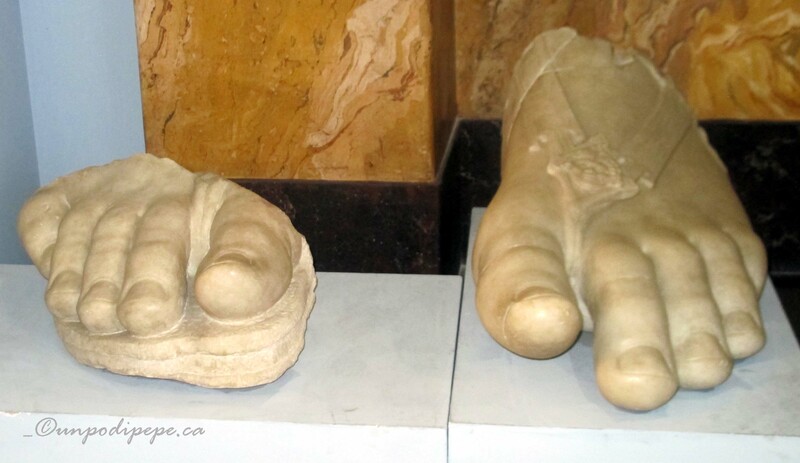 These pieces are Greek originals found in the 1930’s near the Theater of Marcellus. Above this installation hangs the old ‘carroponte‘ (Gantry crane). 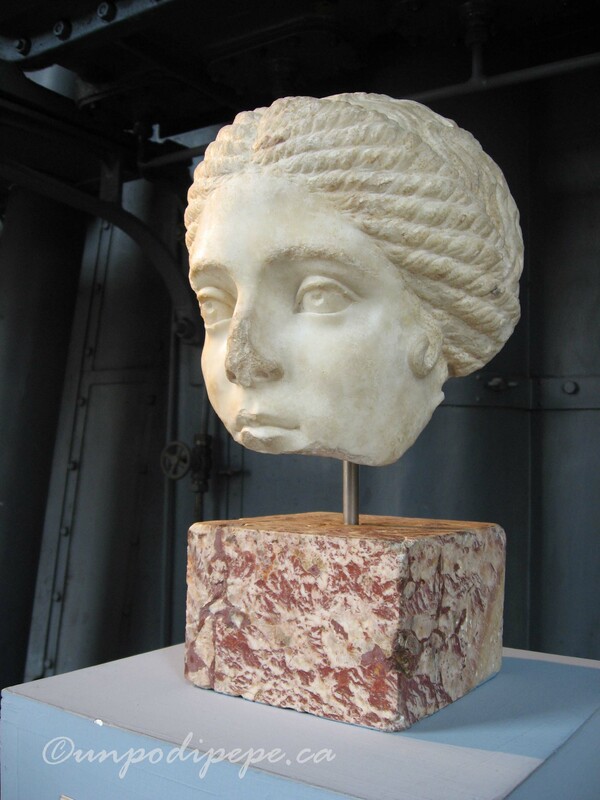 Other ‘meraviglie’ (wonders) include a bust of Cleopatra and the giant head, right arm and feet of an 8m high statue of the Goddess Fortuna found near Largo Argentina. Her feet look very modern with their ‘infraditi’-thong style sandals! Sala Caldaie (Boiler Room) is named for its 15m steam boiler and features a large mosaic of a hunting scene found near Santa Bibiana. 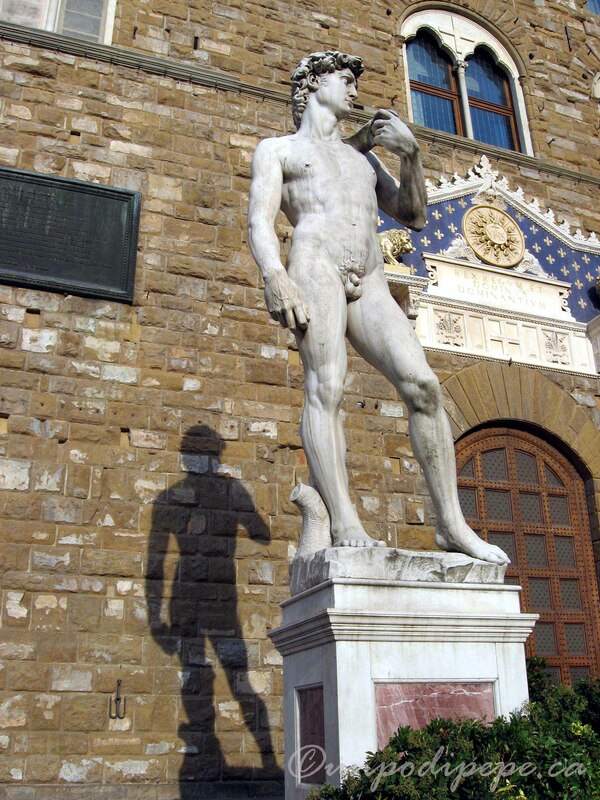 The mosaic is surrounded by sculptures once adorning lavish Roman homes. 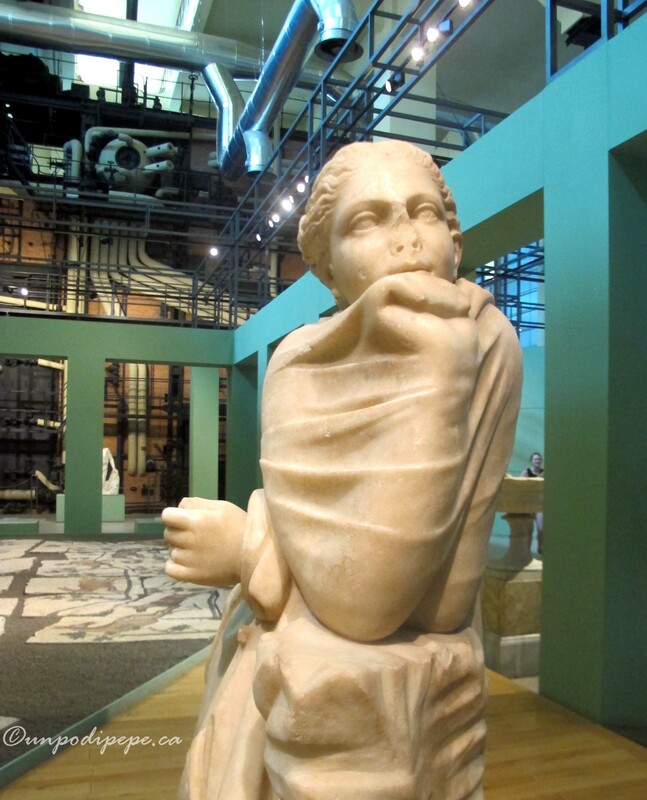 I especially like the statue of Polimnia, muse of poetry and dance. She has her elbows resting on a pillar and her shawl casually wrapped around her. 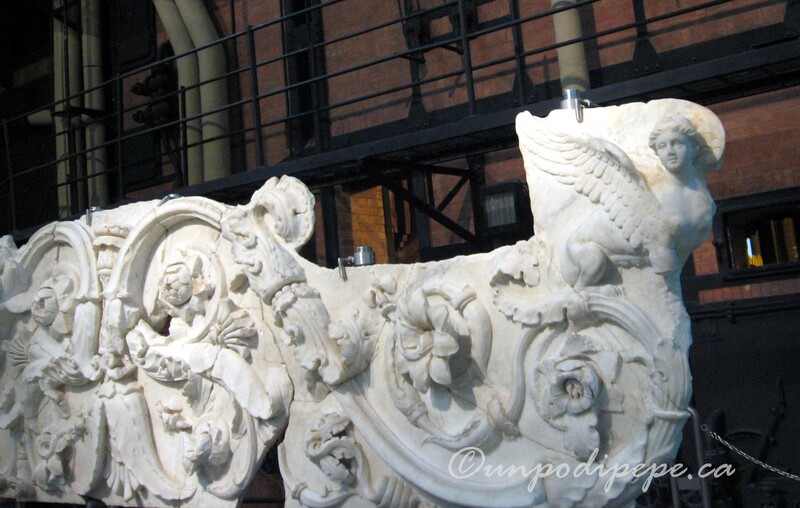 My other favourite in Sala Caldaie is the Sphinx Frieze, which seems to glow against the red brick wall. Sala Caldaie. Sphinx Frieze with Acanthus Spirals. This was part of the Gardens of Sallust and likely represents the victory over Antony and Cleopatra. There were only 4 or 5 other people in the museum both times I visited. One of the staff told me that from October to May they have a lot of school groups visiting through their educational program, but June to September is not very busy. This is opposite to most other museums! I definitely recommend this amazing place, especially if you want to get away from crowds and lineups and see something truly unique. Even people who don’t like museums will appreciate this one-or at least find it oddly fascinating! 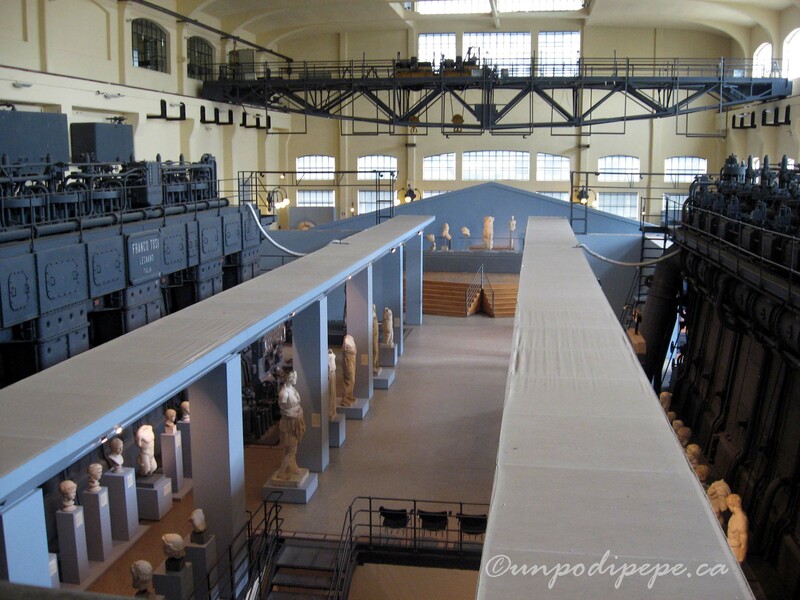 Centrale Montemartini is in the Ostiense area on the left bank of the Tevere. It is south of Roma’s historic center but very accessible by Metro B line Garbatella stop. 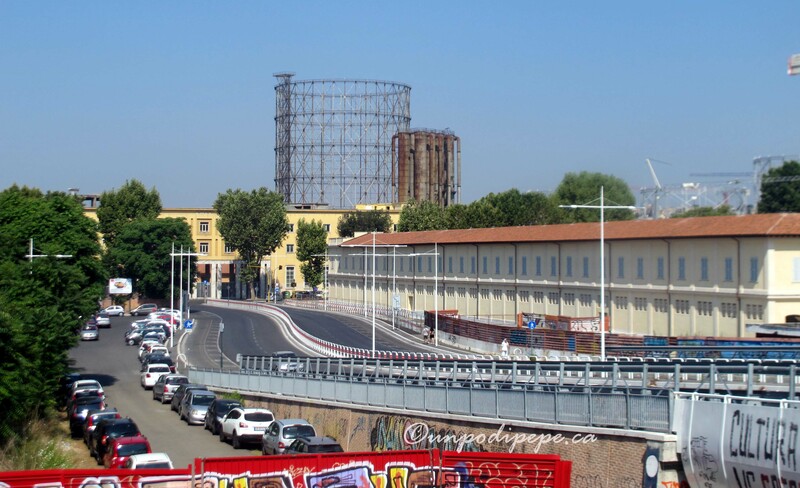 When leaving the metro stop, you will cross a pedestrian bridge and then reach Via Ostiense. Bus 23 goes along Via Ostiense and Stazione Ostiense is also nearby. The view on exiting Garbatella Metro Stop. Via Ostiense is in front, where the yellow building is. Il Gasometro is behind it. Centrale Montemartini is just to the left. The Basilica of San Paolo Fuori le Mura is walking distance, one metro stop away. In between the Basilica and Centrale Montemartini is one of the oldest restaurants in Roma, Al Biondo Tevere at Via Ostiense 178 www.albiondotevere.it serving Roman cuisine overlooking the Tevere. 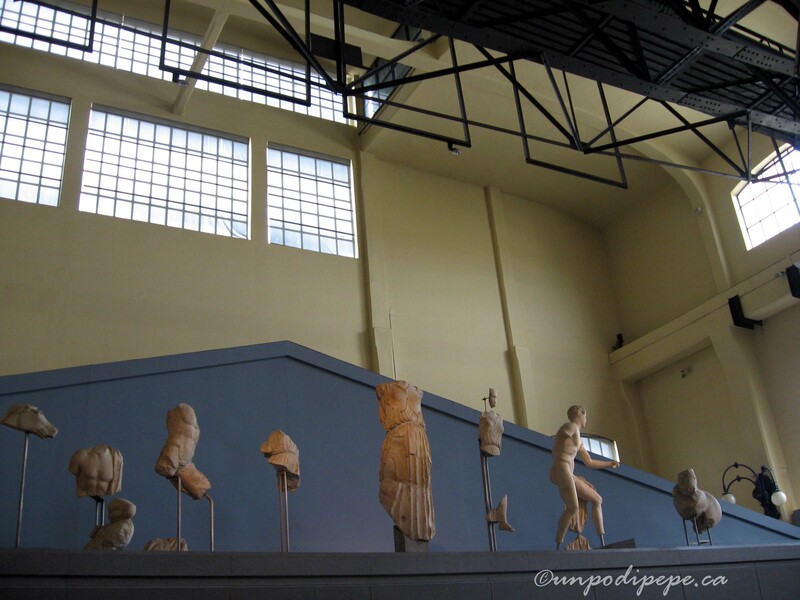 www.centralemontemartini.org Via Ostiense 106, open Tues-Sun from 09-19. Admission is € 7.50 for adults or €16 for the Capitolini Card (valid 7 days). The Romapass can also be used. 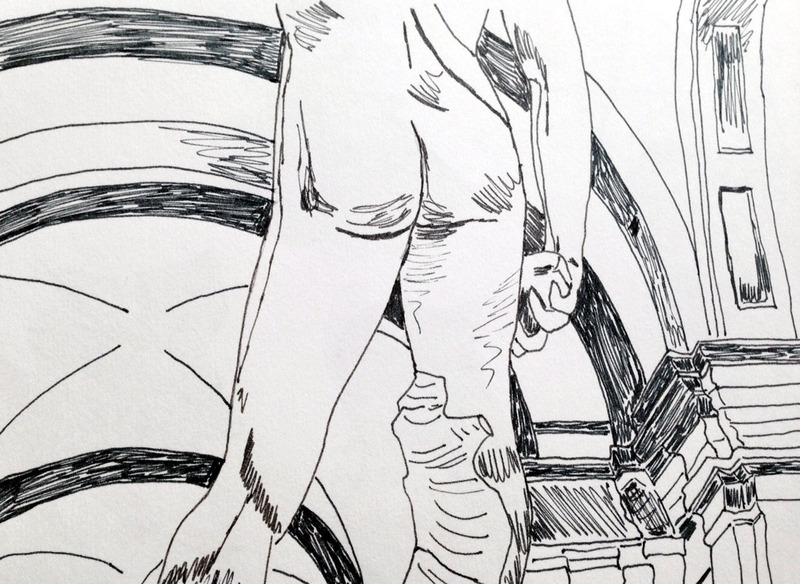 Don’t forget your sketchbook! 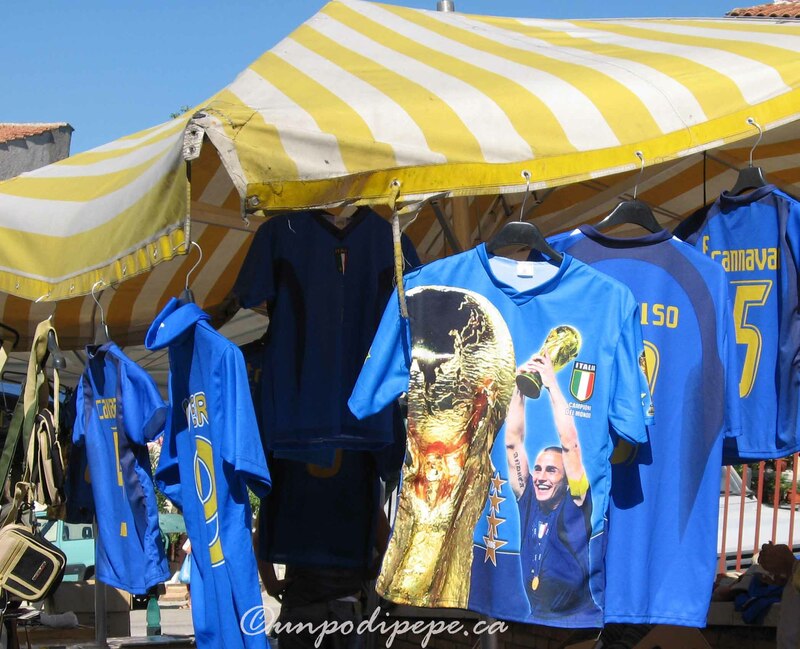 This post is not about Domenico Modugno’s 1958 hit song or the Azzurri, the Italian national team. It is about the long and fascinating history of blue pigment. Although the colour blue is all around us-in the sky, the sea and the mountains, blue pigment is rare in nature. Unlike earth colours, which could be made by going outside and mixing dirt with oil or sap, blue pigment was made with ground minerals which were not easily obtained. This made blue a rare and valuable colour. The Ancient Egyptians made a pigment called blue frit from blue glass ground into powder, but the complicated process of how to make it was lost. Historically, the most prized blue was ultramarine, a warm blue with a brilliant tone, leaning towards violet on the colour wheel. Genuine ultramarine blue was made from ground lapis lazuli stone which has tiny specs of iron pyrite in it that make it glitter like gold. Lapis lazuli comes mainly from one set of mines in the remote Badakhshan area of Northern Afghanistan (formerly Persia). The Sar-i-Sang (Place of the Stones) mines have been in operation continuously for over 6,000 years! Marco Polo explored the area in the 13th Century and wrote ‘there is a mountain in that region where the finest azure (lapis lazuli) in the world is found. It appears in veins like silver streaks’. The name ultramarine does not refer to the colour of the sea. ‘Azzurro oltre mare’ or ‘azzurro oltremarino’ means ‘blue from across the seas’. No one knew exactly where it came from or how it was made, giving it an exotic and mysterious aura. 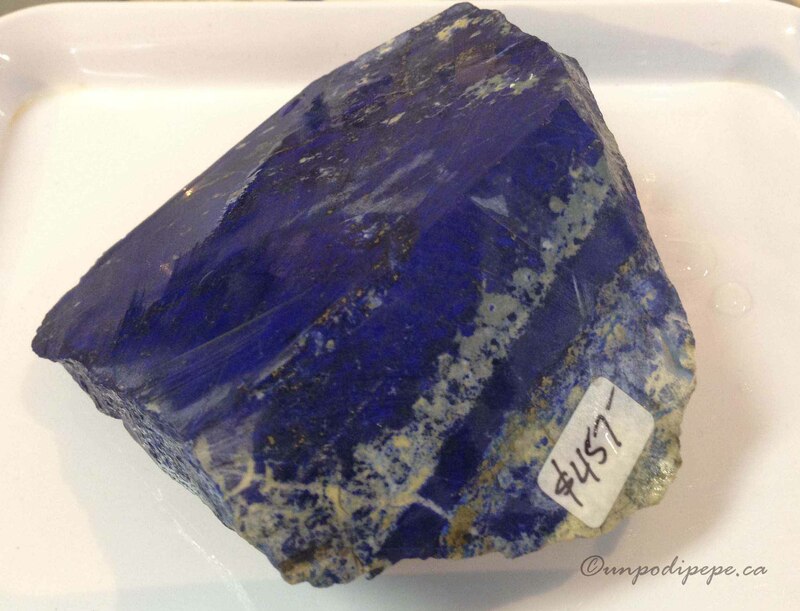 Lapis lazuli from the Sar-i-Sang mines in Afghanistan, courtesy of Mountain Gems, Burnaby BC. Lapis lazuli was exported to all parts of the ancient world and used for jewellery and adornment. It is mentioned in one of the oldest known works of literature, the Mesopotamian poem ‘The Epic of Gilgamesh’ (17-18 C BC). The irises on the Louvre’s 2400 BC alabaster statue of Ebih-II from ancient Mari (modern Syria) are made of lapis lazuli as are the eyebrows of the funeral mask of King Tutankhamun (1341-1323 BC). Cleopatra may have even used very finely powdered lapis lazuli for eyeshadow. Try finding that at Sephora! The process for making a permanent, non-toxic pigment by extracting colour from the lapis lazuli stone was developed in 12th century Persia. Trade of ultramarine to Europe via Venezia started soon after Marco Polo’s time. It was used for manuscript illuminations and painting. In his early 15th century bestseller, ‘Il Libro dell’Arte’ Cennino Cennini writes about how to make the pigment. Powdered lapis lazuli stone was sifted and mixed with pine resin, gum mastic and wax or linseed oil. It was wrapped in cloth, soaked and kneaded with a dilute lye solution until the blue colour was extracted. Cennini wrote ‘ultramarine blue is a color illustrious, beautiful, the most perfect, beyond all other colours; one could not say anything about it, or do anything with it, that its quality would not still surpass’. Extracting colour from lapis lazuli with lye can be compared to pressing olive oil. The process is done 3 times. The first ‘press’, like extra virgin olive oil produces the highest quality colour. The second press, although still good, is a lower quality colour, and the final press would be the equivalent of pomace olive oil. In the 2009 Australian/French documentary ‘Cracking the Colour Code’ Massimo Zecchi can be seen preparing genuine ultramarine pigment for the restoration of a Renaissance altarpiece. During the Renaissance, ultramarine became associated with the divine and heavenly, giving works of art both a sense of spirituality and luxury. Since it was worth more than the same weight in gold, it was used sparingly by Renaissance painters. 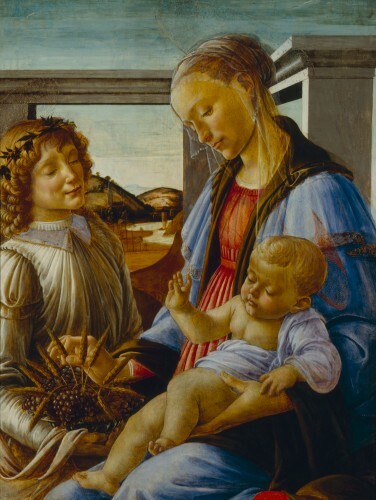 It was reserved for the most important parts of the painting-usually the robes of the Virgin Mary and baby Jesus. Artists would sign contracts with their patrons stating the quality and price to be paid for the pigment. 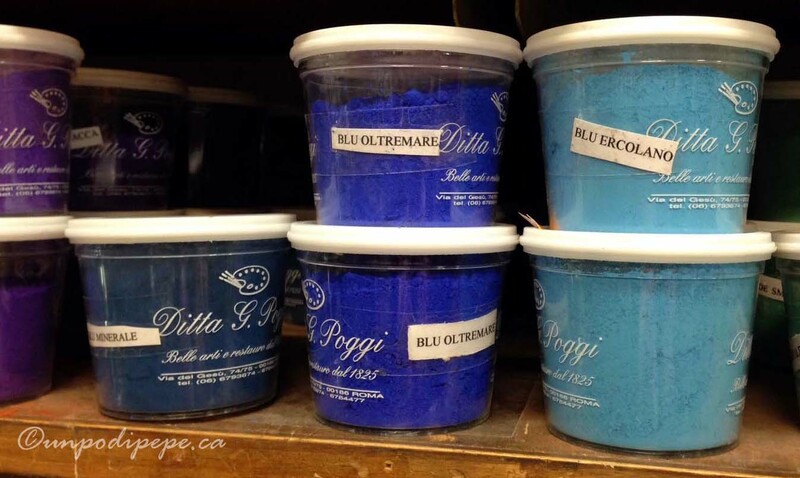 Zecchi Colori e Belle Arti in Firenze has been making artist pigments for over 300 years. On their website 100g of ‘Azzurro oltremarino di lapis lazuli Afgano’ sells for 510 Euro, 10g is €58 2nd quality is €290 for 100g or €38 for 10g. Artists often economized for the underpainting by using blue made with azurite, a mineral mined in France. Then they would add thin layers of ultramarine over top. Azurite makes a paler, greenish blue. It was used for painting skies but would turn dark over time. In one of my favourite paintings, Sandro Botticelli’s 1470 ‘La Madonna dell’ Eucaristia’ (the Madonna of the Eucharist), the difference between the grayed greenish blue of the sky and the brilliant ultramarine of the Madonna’s robe is clearly visible. If you are in Boston, be sure to visit this masterpiece at the Isabella Stewart Gardner Museum because photographs do not do it justice. Ultramarine was not used in fresco painting, as the colour bleaches out in reaction to the acidic wet lime plaster. This meant an enormous amount of the expensive pigment would be needed. Azurite was used for fresco painting. It had a course texture, making it hard to stick to the plaster. Several layers of azurite were needed, giving the fresco a crusty or chalky look. Ultramarine pigment was mixed with a binder-usually egg yolk, and applied to the fresco ‘secco’, after the plaster had dried. 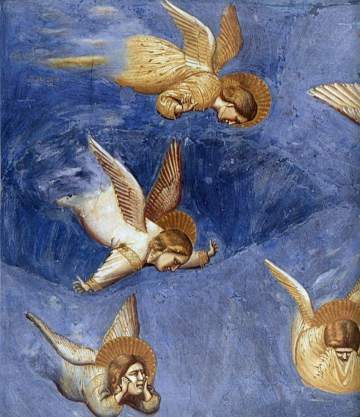 This is how Giotto painted the magnificent Cappella degli Scrovegni in Padova in 1305. 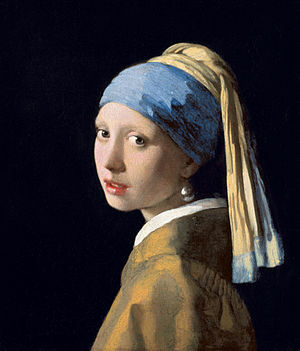 The turban of Johannes Vermeer’s mesmerizing 1665 ‘Girl with a Pearl Earring’ is painted with a mixture of ultramarine and lead white, with many thin glazes of pure ultramarine painstakingly painted over it. Vermeer went into debt buying the pigment! In the 18th Century, oxides from cobalt were used to make a blue similar to the Ancient Egyptian blue frit. Several other blue pigments were also developed, but none could compare to ultramarine. In 1826, the French government offered a prize to produce a synthetic version of ultramarine. Many attempts failed. The final product was named ‘french ultramarine’. Large quantities could be produced at a much lower price. This is the ultramarine blue pigment we use today. It is one of the most important colour discoveries in the history of artist pigments. The next time you crack open a tube of ultramarine blue, squeeze it onto your palette and load it on your brush….you can recall the long and fascinating history that led to the manufacture of your paint! The Italian word for blue is azzurro (ahz·ZOOR·roh), from the Persian word lazhward which morphed into lazulo then became azzurro. The same word is the root of English azure, French azur, Polish lazur, Romanian azuriu, Spanish and Portuguese azul, and Hungarian azúr. Lapis is Latin for stone, thus lapis lazuli means blue stone.